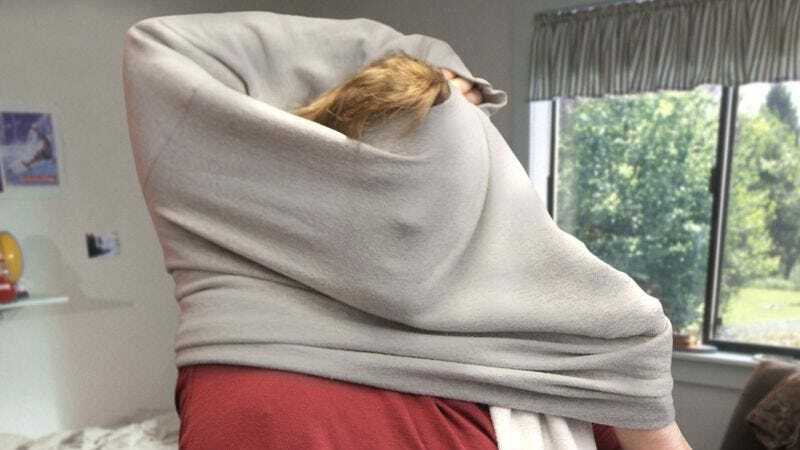 GARY, IN—Struggling valiantly against the elusive long-sleeved garment, local man Kyle Villalobos is currently locked in a protracted battle to locate the neckhole of his sweatshirt, sources said Monday. “Come on,” said Villalobos, refusing to surrender to the cotton-polyester crewneck that enveloped him down to his shoulders and fighting on even after mistakenly trying to fit his head through the left armhole. “Dammit! Where is this thing?” At press time, Villalobos had emerged triumphantly from the sweatshirt only to discover he was wearing it backwards.